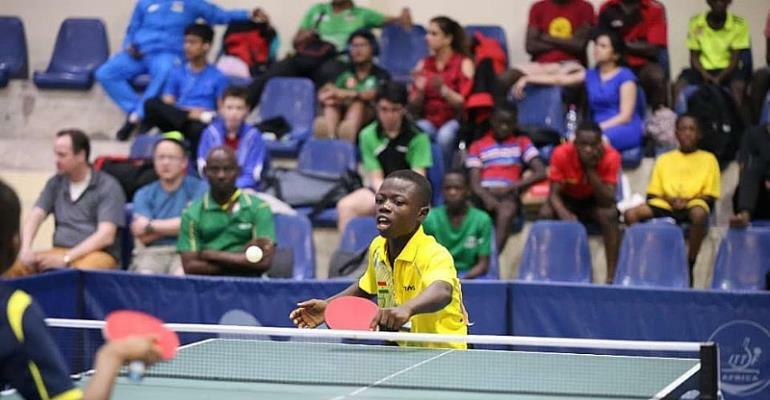 Ibrahim Gado was the toast of his coaches and teammates on Friday, April 5, 2019, when he won Ghana's only gold medal at the Mini Cadet Boys (Singles) in the World Juniors Table Tennis Championships. Backed by the home support the young boy from Kwanyako in the Central region beat his opponent Mutshu Neredi Bovoyi of DR. Congo by 3-0. Coach Eben Nana Whyte, coach of Ghana said he was very happy for Gedo as the victory will urge him on to greater heights as this is his first international competition which team Ghana started slowly and later warmed themselves into the competition. The team from Nigeria did very well to win 6 gold, 6 silver and 7 bronze medals, while the Indians who stole the show also collected 6 gold. Female coach of Nigeria, Aderibigbe who spoke to Yours Truly said they discover their players at a tender age and groom them into superstars, by training frequently and competing at many international tournaments. Mawuko Afadzinu, president of the Ghana Table Tennis Association (GTTA) said the Ghanaian players lacked exposure and experience, so he appealed to the government to support the players and the association. He observed that Ghana needs to play at more competitions for the players gain confidence, exposure and experience like most of the opponents who are often participating in international opens. He commended the media for supporting Table Tennis and also reporting on the international event in Ghana after so many years. Ken Ashigbe, vice president of the GTTA who was also impressed with the performance of Gedo said Ghana Table Tennis can rise again with the hosting and participation in more events. “I never expected that we can win a gold medal with the level and standard of the competition, and I think Gedo has done very well for the nation. We have to build the confidence of our players because the interest has been shown that Ghana has some potential”. Some of the countries that took part in the 2019 World Cadet Open were Ghana, England, India, Saudi Arabia, Nigeria, Mauritius and Congo DR. The tournament was sponsored by Stanbic Bank, Graphic Communications and Awake Mineral Water.